This week someone was asking about the difficulties in playing along with recordings that are not at A-440. You can change the pitch of a CD recording so that you can play along with it. You simply create an mp3 or wav file, and open the music tracks in Audacity, or other freeware that can change the pitch; then click on Edit, then, "Select-all" and then Effects to change the pitch in the effects menu to A-440. Doing this darkens the recording, of course, and can sound oddly electronic on playback, but then you can use the new flatter version as a playalong recording. I've done this with a few pieces, and burned my own playalong CDs from them, especially when rehearsing remotely from other chamber musicians, and wanting to hear the chords and other features of harmony for practise. If you simply want to know what pitch centre a given recording is being performed at, use an electronic tuner that has a pitch change mode button, and, in that way, you can find out what pitch center your recording is in. I have an inexpensive electronic tuner has a button that moves the main pitch center from A435 step by step up to A445 and then one can switch function to indicate the pitch of every semitone at the new pitch centre. By singing or playing an A-natural from the original CD that perfectly matches, pressing pause (so you can re-check) and then simply singing or playing it INTO the handheld electronic tuner,you can discover what pitch the whole track has been recorded at. I used my handheld tuner to determine that the "A" in the Beethoven Serenade opus 25 Galway recording is at A-446 in the Adagio movement. I'd love to hear more about reel-to-reel speeding up for "brightness" and other facts from the past recording industry from those who might know more. I'd also like to know what pitches the piano tuners use in recording studios in various geographic regions; as far as I've heard, Germany has the highest pitch, whereas most other countries try to stick to A-440 or A442, both of which are easier for A-442 flutes being made today. Best, and I welcome input. 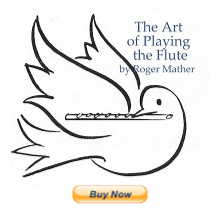 What do you do if you want to play along with a European flute CD where the flutist is playing very sharp compared to A-440? You can quite quickly and simply change the pitch of the track from that CD, using a software like Audacity. You can alter any track of any track of any CD, and keep the altered pitch-corrected versions in a folder on your computer, or transfer them to a CD or mp3 player to play along with. And, of course, you can burn a new "fixed pitch" CD version for yourself, or just save the mp3 of the corrected pitch version for your own practice and playalong with an mp3 player and speakers turned up in your practice space. Or if you practice near your computer, just play the new fixed pitch track back from your computer speakers. Very fun to play along comfortably at your true pitch of A-440. How to change the pitch of a CD using Audacity software (free download). Also download "Lame encoder" which allows you to make mp3s for any created sound file. Place the Lame Encoder in your document folders where you can find it again. When you save your first mp3, Audacity will ask you where to find the lame encoder, and you just point to it in your folders. 2. Copy or "Rip" the CD track to your computer hardrive using whichever "CD-rip" function you have on your computer already: Windows Media Player or Real Player etc. Example - James Galway - Bach Sonatas in MY MUSIC. (if the name of the CD was found by the computer when it ripped the track, then the folder in My Music will also be called something like the artist's name or title of the CD). 4. Open the sound program called Audacity on your desktop by clicking on it. 5. Open the music track you wish to work with in Audacity. (File - Open - choose track by name [look in MY MUSIC for the track you just ripped onto your hardrive and have located before]. 6. Select the entire track (Edit - Select - All). The track will turn blue to show it's all selected. Click on "Effect" in the top menu. A pop-up will appear asking for numbers to be put in. Choose any note-name A, or B, for example, but check the box for the word DOWN to indicate you want the pitch to go down. Next: Choose the numbers for the next pop-up item called "Semitone (half-step)"
You'll want to type in a number in the range of negative -0.15 to -0.18 in order to make the pitch go down by a certain percentage. Click OK. to have the whole track lowered in pitch. The recording can then be tested by playing it back over the speakers and playing along with it (warm your flute so it doesn't play too flat!). You will hear that the pitch changed track is slightly lower in pitch now. Play it back over the speakers, from the beginning, with your flute and the sheetmusic to hand. Put an electronic tuner on your stand to check the pitch you're now matching with your flute. If the track is playing back with a pitch too low or too high to play with your normal embouchure, air speed and loudness, just click UNDO in the Edit menu to go back to the original pitch, then re-do a new set of trial numbers. (Edit-Undo). When you choose a new value to lower the pitch a little more or a little less, you'll eventually get the pitch perfectly at A-440. Fine tune your choices. Sometimes you have to repeat this three times, but it only takes a few seconds with new numbers put in. Some experimentation is required at choosing the numbers, but it's quite easy and you undo or redo any pitch change you just tried. For most flute recordings that are very sharp, A-445, a -1.000% change will bring them down to A-440. For a flute recording at A-443, you can use a fraction of negative one percent. For example: When I worked on a Galway Bach recording I used a value of -0.15 semitones, and that instantly set the pitch drop at this percentage: -0.863%. 9. Save your newly corrected version as an mp3, now, using a new name for the track. How to figure out what percentage to lower a track? I would like to know how the CD players and stereos are set up! And think it would be great if someone would innovate a line of affordable/portable CD players perfect for young musicians to play along with but in tune to a true A 440. Do others believe it is the actual CD player? And if yes, does anyone know which affordable CD players will play in tune and not so sharp? I have this problem but actually believe what I am experiencing is a problem with the actual stereo/CD player. I have been told that the CDS these days for the most part are pitched to A- 440. I observe that depending on which Cd player the CD is played in, the pitch is altered. Does anyone else believe it could be the actual CD player? I usually have to push the headjoint in all the way even when I am supposedly tuning to the provided tuning note on the CD that is declared to be at A-440 and then am still flat and can't reach the provided sharp pitch on the CD...very frustrating. Of course the hand held machine tuner always shows that my recordings (being played on an inexpensive CD player) are very sharp; so sharp that like I said, my flute can not play along without being slightly under the pitch. Does anyone know which affordable CD players will actually play the CDS at A 440? In the future,I would like to see some research done in this area and would like affordable A-440 CD players to be made available to young musicians so that these 'A-440' cds will truly play at A 440. I suppose it is possible that a particular CD-player is not playing a true A-440. If you play the A on the Tuning CD and hold an electronic tuner up to it (callibrated to A-440) how many cents flat or sharp is the CD player's note? If you play the same CD across your computer's speakers, how many cents flat/sharp is the A-440 then?